The film is set around Whitehead Correctional Institute. Sabrina Downs and Frances Shephard are riding on a bus that takes them to the institution. Sabrina is explaining how life can be as a convict, while Frances who has never been to prison listens in fear. Frances kills her husband in self defense and subsequently is sent to prison. Immediately upon stepping foot off the bus the women met Captain Alan Dease, and he explains the rules of the prison. Frances walks through the prison to her cell, and she can not help but observe the women smoking and talking petty crimes amongst themselves. Frances's cell mate is Lil’ Mama, and she is a Christian. Lil' Mama is pregnant, but that does not stop her from introducing Frances to other inmates. She meets West, and West informs her that there are different groups through out the prison. It doesn't take long before Frances adapts with the mundane hard work that prison life offers. Frances however is not the only one that is new to the prison. Michael Meadows a young law student works as a correctional officer. He meets with Deas, an he begins by telling Michael that he is in charge. Michael listens on as Warden Nelson and Deas talks about getting money from the prison. Inmates talk that Deas's girlfriend is inmate Aiesha. She keeps Deas on top of the inmates' activities. When Aiesha gets into a fight Deas is there, but he treats her with no respect. Aiesha believes Frances is the one who reports her, and she finds Frances and strikes her also stealing her necklace. Nikki the inmate who Aiesha was fighting stabs her. The guard beats Nikki. Deas beats her because he loves her. Nikki does not want anything to do with Deas. Michael discovers that the women are not given fair working conditions, and the inmates start a petition to end the unfair treatment. Everything comes full force when Aisha tricks Deas in seducing her while everything is on film. Lil Ma brings the tape to Deas, but he rapes her. Lil Ma dies, and the prison is sent in an uproar. The prison closed down for illegal acts. 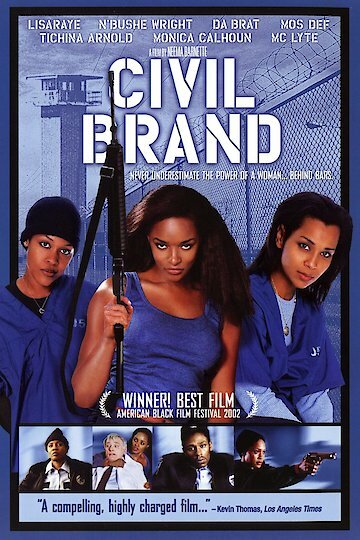 Civil Brand is currently available to watch and stream, download, buy on demand at Amazon Prime, Starz, Amazon, Vudu, iTunes, YouTube VOD online.